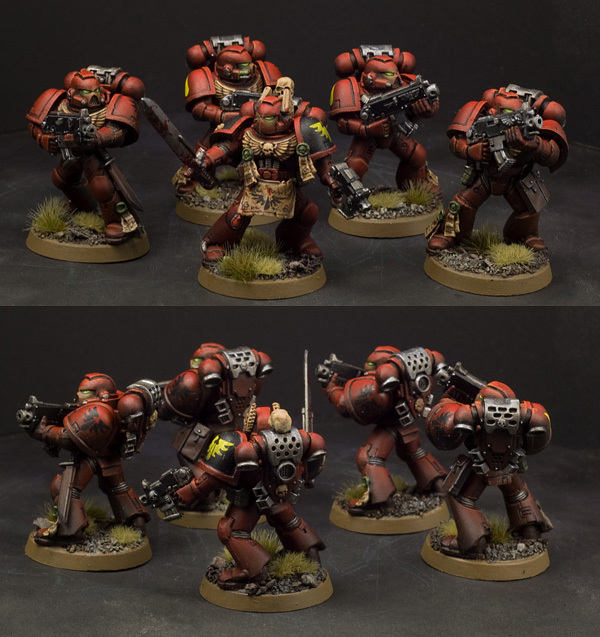 MASSIVE VOODOO: Blood Angels army for sale! You know... sometimes you just have to get rid of something that blocks your head and feels like a chain on your foot holding you from freedom. For me such a thing is my Blood Angels army. I really love them, i invested countless hours converting, painting, assembling and giving my heart and sweat to those little fellas. But now i really don't have the muse to play with them anymore. I want to concentrate myself on pure display painting and there is no space for an army. Today i photographed everything i want to sell. 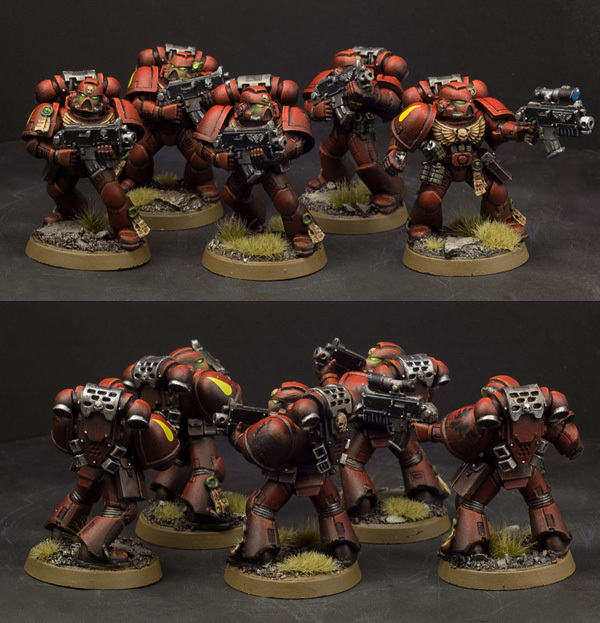 There are 30 Kommentare for Blood Angels army for sale! 1) You'll never get what they should be worth to you. Armies give a diminishing return on eBay over single models. 2) Some day, one or two or three years from now you'll want to play 40K again. Even if only a casual pick up game. Then you'll shed a tear over that army you once had. 3) How many people can boast a fully painted army to that standard? That's something to hold and cherish. It's a badge of honor. An AMAZING achievement. Put it in a display case and it should make you feel better every time you look at it. 4) Despite GW's constant frittering around with the rules and models I'd still be able to use those models I sold off some ten years ago. If you must sell it, don't sell it as an army. 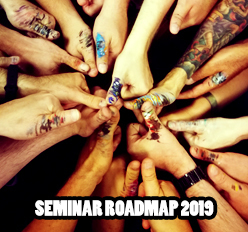 You'll get more money if you break it up into parts and sell off each squad and character individually. I must say I totally agree with Glen Murie: if you can help it, don't sell it! Such an unique army, with all those conversions, large and small, plus the great individual touch you've given each and every miniature in the army.. I dont claim to be clairvoiant or nothing, but I believe you'll regret it if you sell it. So unless you desperately need money (which I believe you wrote you didn't), hold on to it, loan it out to some minature store or something if you've got space problems. 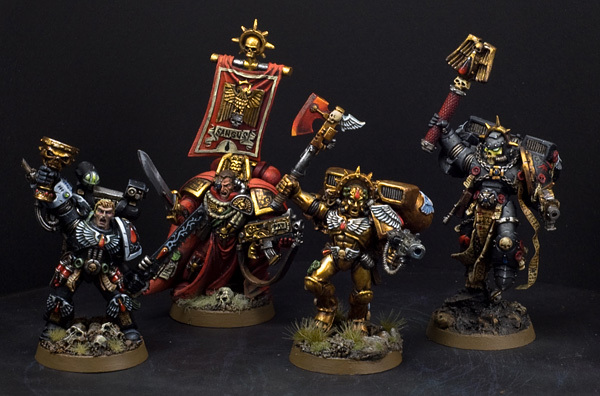 I believe it's one thing to paint up a miniature, with a sale at the end planned from the beginning, but something completely different to sell something so personal as an army you've fought with - both in games and on the painting table. But thank you for sharing the pictures! I do not have any Blood Angel army myself, but my Space Hulk miniatures sorely needs paint, and this has proven to be a good boost of inspiration and motivation to keep going. 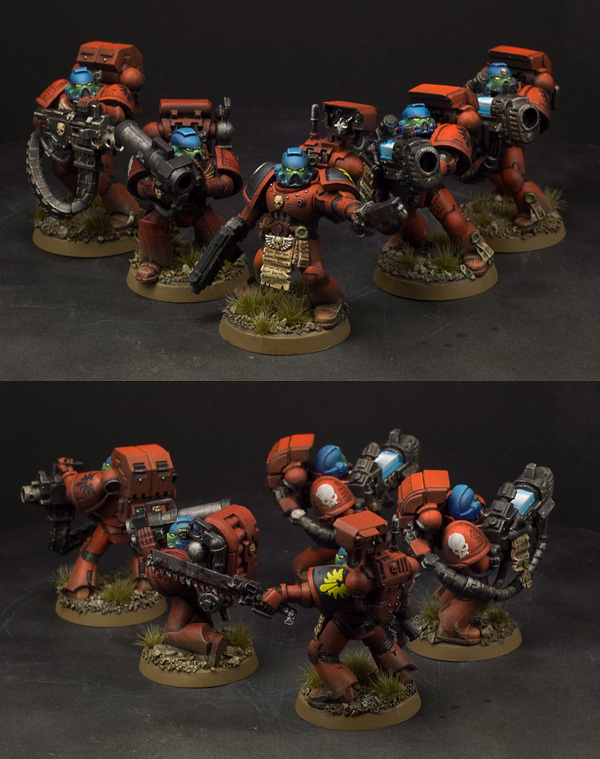 That is the most beautiful Blood Angels army I have ever seen! I'd agree with the above. Definitely keep it! I'm building a space wolves army right now and i know how much effort I've put into it so far, and its not half the size of yours yet. PS. 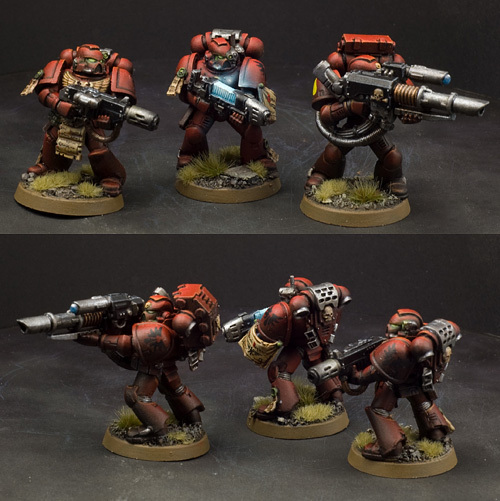 When building your army were you painting one at a time or in batches? roughly how long per model? i feel that at the rate I'm going it'll never get done as i am going at it one at a time! One of the best painted armys ive ever seen. If you dont really need to dont sell it plz. Yea, this army really rocks. But I like the way you chose, if you say you want to concentrate on painting not on gaming. 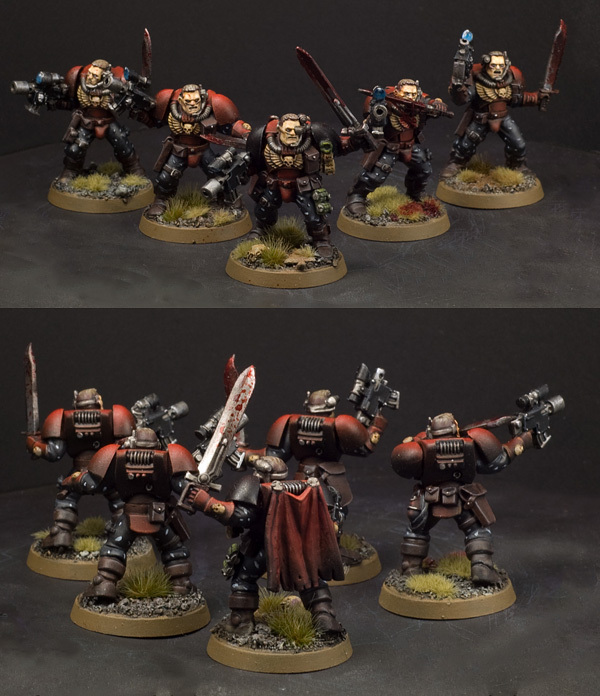 Gorgeous army to say the least! It definitely would be a shame to sell em off and never really know if each piece is receiving the care and attention that it deserves whether on display or on the battle field. The weathering is my favorite by far with the muddy grime carefully splattered among ever troop! How did you go about getting those mud effects on your vehicles wheels and tracks!? Superb work! nice army, i agree with those guys who try to convince you to keep your army. its too good to sell. if you dont have the space for it. put it into a box and store it away somewhere. ps: is that real mud on the tanks?? Cool and nice army Raffa, pitty its not my colour scheme chapter (Flesh Tearers) ;-) and that I can´t make any offer that is enough to buy and save that excellent army from getting ripped apart cause I think this is going to happen if you´re still going to sell it ;-( such a shame but I respect your will to get rid of ´em...I couldn´t do that. I am with Raffa on this one, sometimes you just ave to get rid of stuff and make room inside your mind. A very pure and strong decision like the one Raffa made about selling the army, deserves lots of respect imo as it comes from the heart and not the wallet. You have my best wishes on selling them to a good price. They all look pretty good. Can`t say anything useful about to sell minis because iself also haven`t got problems to give my minis away. It is like Mati says: It makes room inside ones mind. Get rid of those miniatures! I think there will be somebody else to take good care of them and admire your paintjob. I agree with Mati, it's necessary freeing your mind of all those miniatures standing around somewhere without real attention. For sure: Only sell for the right price! Hm i painted them in batches from 5-20 miniatures (although the 20 mini batch was a hell to bite throug)... i needed around 3-4 hours for each fella. 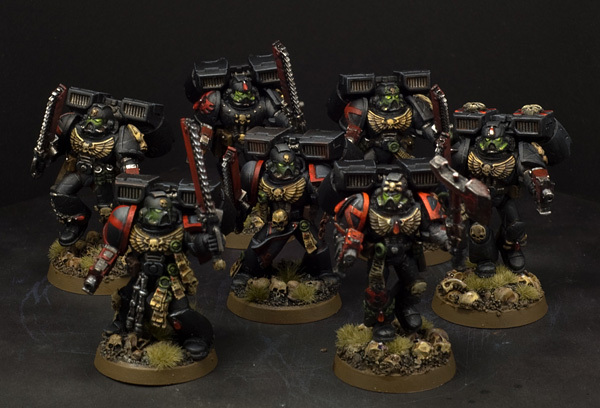 Ive just scrolled through this from a link on BaC and I want to say that is the best painted army I have ever seen. This may be in the complete wrong are of your forum/blog, but how do you paint that blue hue coming off the plasma gun? Is this still up for sale? If it is how much is it because it looks great, oh well I don't think I can get it with my low budget. Are you still for sale? how much are you trying to get for it? The army is as good as sold for 2500 Euro including an additional Rhino and a Baal Predator and Transport Cases. These are amazing. I love how you'd painted various parts glowing! It's sad that you're selling them! Well any il buy the army name a price! Honestly, you REALLY need to put up a tutorial or something. 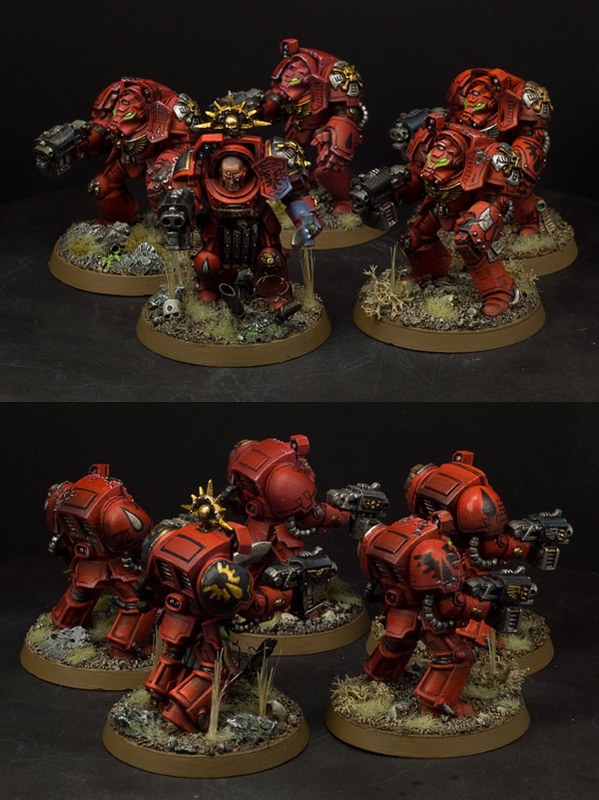 The paint job of these Blood Angels is bloody (excuse the pun) beautiful. I would love to buy these if still available. I'm sorry to tell you they're already sold. 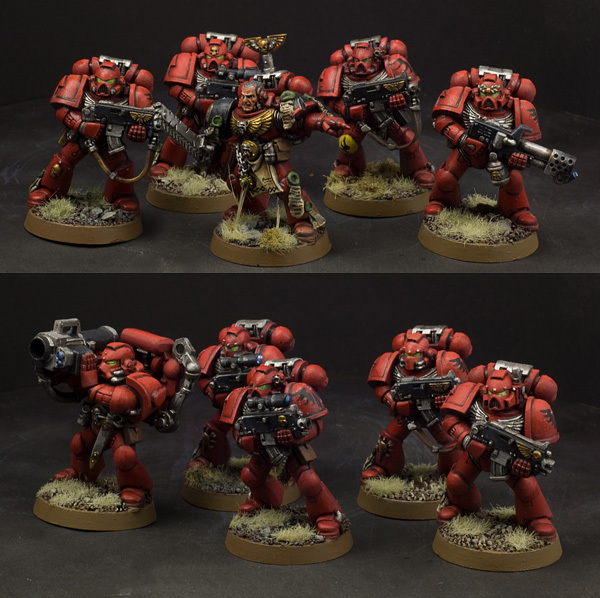 I am STARTING warhammer 40k from scratch on the easter holidays and i really need some tips on how to paint the blood angels to make them look good. How do you do the mud on the motorbikes/rhino and the black dirt on your soldiers legs ? I really want to reproduce this on my dark angels army. 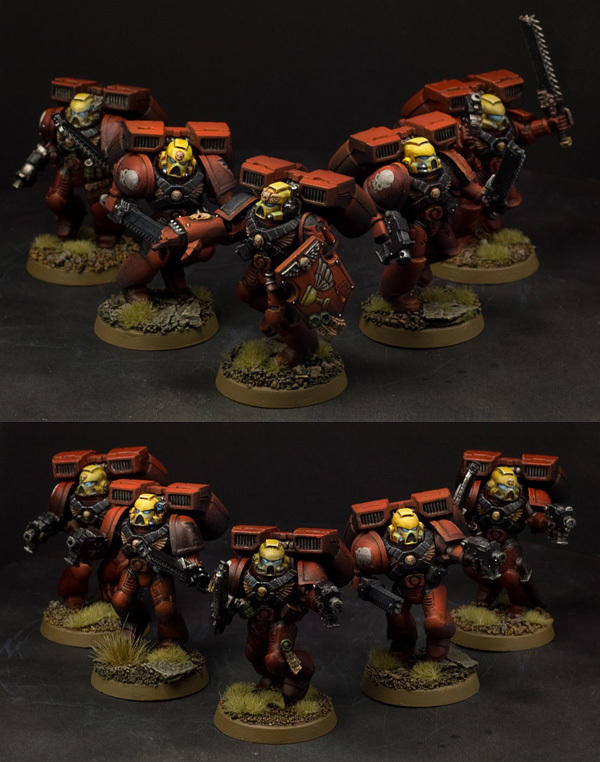 You're Blood Angels are totally awesome, hope you will not regret to sell it. Sir, you inspire me to now paint my Titan Angels with insignia and borders like your terminators. It gives a bland model unique details to individualise them. Thank you for posting your army!